The scene is all too familiar: Six-year-old Jesse is frustrated because he’s having trouble waiting and wants to go play his video game. In the time it takes to draw a breath, he’s melting down. You saw the signs but felt powerless to stop it as first he gave a low growl, the precursor to the bloodcurdling scream you know so well, then Jesse pressed his hands to his head as if trying to keep it intact. Whispering frantically that he just needs to wait a few more minutes until you can check out with your groceries, you know the tidal wave is coming and neither you nor Jesse knows how to stop it. Soon, your face is as red with humiliation as Jesse’s is from screaming. Instead of having to abandon your shopping in the aisle and hurry to the parking, come prepared with a toolkit. These tools can make life infinitely easier for you and for the child in your life. When a little one has Autism Spectrum Disorder (ASD) or any of a variety of sensory processing disorders, even the simplest errand seems surrounded by barbed wire…a potential ordeal with an unpredictable and sometimes miserable outcome. Reinforce your child’s use of verbal language to express himself instead of shrieking in a sort of inarticulate, helpless rage. Since the functional use of language is a reasonable educational goal for school-age children with ASD, any activities parents and teachers can provide to support productive communication are essential practice. You’ll apply the acronym PAR (for plan, attend, redirect) to smooth the way for a more communicative less combative experience. Ideally, you have a chance to prepare your child before an errand, even a last-minute one, to make the trip go smoothly. The first step in Planning is to identify the objective. Begin by asking your child if he can help you while you go to the store to get asparagus, chicken and peaches for dinner. Telling him the destination, framing it with a specific purpose and listing the exact items you need (preferably very few) make this a finite and more manageable task for your child. If your child is a reader, ask him to help you write down the items you need on a list so he can monitor it and remind you which provides him with a structured role and expectation. If your little one isn’t a reader or writer yet, take five minutes to print out a pictorial list for him with a picture of a bunch of asparagus, raw chicken, and a bag of peaches so he can carry the printout and mark off the groceries as you buy them. Secondly, you’ll explore the details and prepare for contingencies like a delay in line. Talk about how far you’ll have to go to get to the store, which you know among the workers whom your child may recognize, how long you think it will take to get what you need. Ask whether your child prefers to carry the basket or the list. Remind him that you stay together in the store and that while you wait in line to pay for your food ask if he prefers to play I-Spy or Rock-Paper-Scissors. Try to guess how many rounds you can play before the groceries are paid for…this gives him something to focus on during the irksome wait. For example, you might say, “I think we can play seven rounds of RPS and that I’ll win four times. What do you think?” Now you’re armed with a plan, which sets you up for more likely success. Lastly, you’ll ask your child how he feels about the task and its objective. Use feelings flash cards for support if your child responds to those in emotion identification. Do you feel excited because you love asparagus and the store has a large plastic goldfish display you love to look at? Do you feel frustrated because you have to stop playing Mario Kart to go inside the store? Talk about why he feels the way he does and what would improve it. Take the minutes necessary to articulate the feeling and reasons for it and truly collaborate with your child. Sit beside him to discuss this, not face to face because some children with ASD find eye contact challenging (either confrontational or simply exhausting) and really empathize. If it’s truly a sudden errand and you don’t have the five or ten minutes you need to lay the groundwork, spare a couple of sentences for your child, giving the reason and specific purpose for the task such as, “I have to mail this bill I forgot about and the post office is closing soon. I need to go in and buy a stamp and have the postmaster look up the exact postal code and then we can go. I think it will take about three minutes if there’s no line. If there is a queue, what do you want to play?” If he isn’t in the mood for a waiting game, see how many types of stamps or sizes of shipping boxes you can count…use the environment to find a focus object or game for the duration. No matter how much hurry you are in, be present for your child. 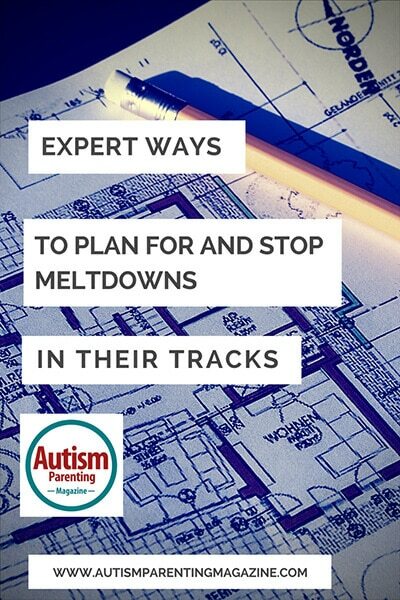 We can prevent a surprising number of meltdowns by attending to what is going on with your child. You’re in line for a latte or on the mobile with your mother and you just want your ASD child to wait quietly—but there are warning signs you know too well. He starts shifting from foot to foot or humming loudly or saying “Mom” repeatedly in that monotone that you know will escalate quickly. The first part of Attending is the pause. Stop what you’re doing, turn fully toward your child and speak to him. After you pause, communicate. Since functional communication is a major goal for your little one, encourage that by inquiring what he wanted. Ask what he wants to tell you or show you. And pay attention to what he is saying, even if your mother was in the middle of a sentence or you were counting out change for the barista. Say, “Just a moment, please” to the adult in the scenario and concentrate on the child. Sometimes that thirty seconds of true attention will relax your child and deescalate the situation. If what he wanted was for you to get off the phone or stop playing Angry Birds or leave the coffee bar and go buy him a Mini Cooper, it’s best to find out. If he wants attention for attention’s sake, and doesn’t like being left out, give him a job to do. Tell him you need him to listen for them to call your name with your order or you need him to look for a clock in the restaurant and tell you what time it is because Granny won’t quit talking and you can’t see the time on your phone when it’s in use. Have him find you something in your handbag like an ink pen or Chapstick. Give him a task to attend to while you are temporarily occupied. When you didn’t have time to prepare properly or you couldn’t get a word in edgeways to interrupt your phone call and truly attend to your child’s attempts to gain your notice—or if those steps didn’t fully prevent the emotional flooding of an overwhelmed child, it’s time to Redirect. This is where you pull out the tangible tools of the trade. It’s distraction time, but instead of forking over your iPhone in hopes of three minutes’ peace, choose something with a reinforcing sensorial component that you and your child have pre-identified so he can pick the feeling he has and match it with a Redirection Item. • Magnets—plastic coated bar magnets are available in toy shops and teaching materials stores. A pair of them can clack together, resist being pulled apart, pick up a paper clip, or be stacked, dragged apart, generally can be an entertaining small toy with the added inducement of the invisible magnetism to bring mystery to the savor. These are excellent for a reward…like, “you’ve been such a champion during this trip to the shop. Want to play with your magnets now?” and let him stick them onto the metal shopping basket and fiddle with them the rest of the time. Label them “Strong” because he’s been strong in his mind mastering his emotions and meeting the objective. With the simple PAR acronym, you’ve learned to prepare, attend to and redirect your ASD child. Use this technique to reduce the number and severity of meltdowns and help your little one identify and explain his feelings for functional communication practice. Lora Brothers lives in rural Illinois where she teaches second grade in a high-poverty school. Lora has a BS in Elementary Education and MS in Education Administration. She enjoys using her classroom experience working with special needs children to inform her freelance writing. She lives in an adorable red house with her husband, daughter and two tyrannical miniature poodles.